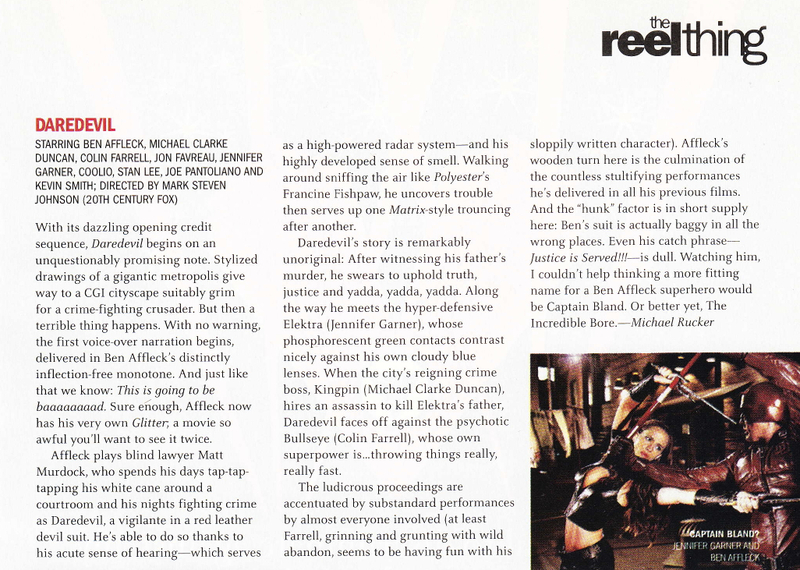 With its dazzling opening credit sequence, Daredevil begins on an unquestionably promising note. Stylized drawings of a gigantic metropolis give way to a CGI cityscape suitably grim for a crime-fighting crusader. But then, a terrible thing happens. With no warning, the first voiceover narration begins, delivered in Ben Affleck’s distinctly inflection-free monotone. And just like that we know: this is going to be baaaaaaaad. Sure enough, Affleck now has his very own Glitter; a movie so awful you’ll want to see it twice. 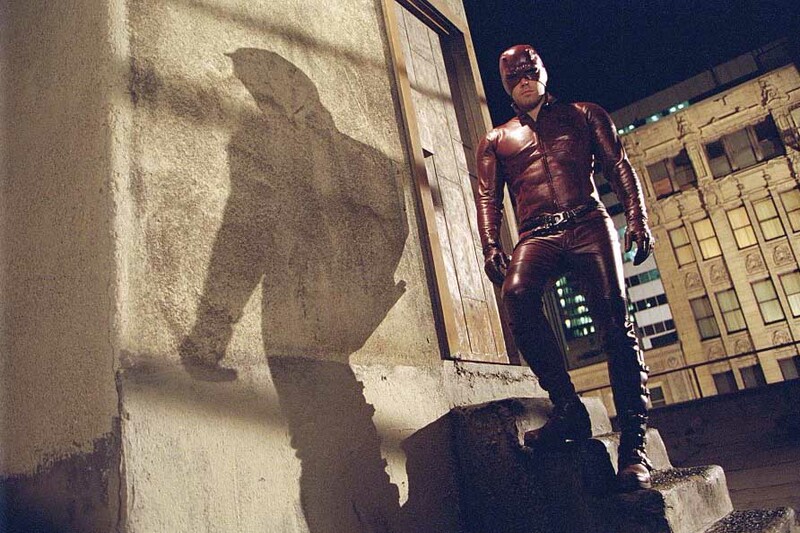 Affleck is blind lawyer Matt Murdock, who spends his days tap-tap-tapping his white cane around a courtroom and his nights fighting crime as Daredevil, a vigilante in a red leather devil suit. He’s able to do so thanks to his acute sense of hearing – which serves as a high-powered radar system – and his highly developed sense of smell. Walking around sniffing the air like Polyester’s Francine Fishpaw, he uncovers trouble then serves up one Matrix-style trouncing after another. Daredevil’s story is remarkably unoriginal: after witnessing his father’s murder, he swears to uphold truth, justice, and yadda, yadda, yadda. Along the way he meets the hyper-defensive Elektra (Jennifer Garner), whose phosphorescent green contacts contrast nicely against his own cloudy blue lenses. When the city’s reigning crime boss, Kingpin (Michael Clarke Duncan), hires an assassin to kill Elektra’s father, Daredevil faces off against the psychotic Bullseye (Colin Farrell), whose own superpower is…throwing things really, really fast. The ludicrous proceedings are accentuated by substandard performances by almost everyone involved (at least Farrell, grinning and grunting with wild abandon, seems to be having fun with his sloppily written character). Affleck’s wooden turn here is the culmination of the countless stultifying performances he’s delivered in all his previous films. Even his catchphrase – “Justice is Served!!! – is dull. Watching him, I couldn’t help thinking a more fitting name for a Ben Affleck superhero would be Captain Bland. Or better yet, The Incredible Bore.